FRC Team 6004, f(x) Robotics is coached by Mr. Troy Brindle and Mr. Walter Myer. We are in our fourth year as a competition team. f(x) Robotics began in 2016 with only seven students but has grown to twenty over the last three competition season. We anticipate an even larger growth in the coming years. Our team is made up of a diverse group of students from around the county. We have also had an increase in the number of females, not only as team members, but also as mentors and coaches. With rapid growth and increasing community outreach, it can be difficult to maintain enough financial support. There are significant costs for both the competition events and our robot as well as costs for tools, safety supplies, transportation and team merchandise. Most of our funds come from local businesses, but we are outgrowing the support they can offer. With the hopeful expectation of competing on the State and World level, our annual operating budget runs around $50,000. A detailed budget is available on request. We are asking for your help. In return for monetary support, we offer many sponsor benefits such as advertising on the competition robot, team shirts and website. These benefits are based on sponsorship levels associated with the amount donated. Donations of parts, discounts and mentor volunteering is also highly appreciated. We are a nonprofit organization, so all donations are tax deductible. Any support offered to Team 6004 will help enrich our ability to teach students about opportunities in the fields of science, technology, engineering and mathematics and prepare us to be leaders in these fields. Students learn everything from electronics, programming, design, painting, marketing, and much more. 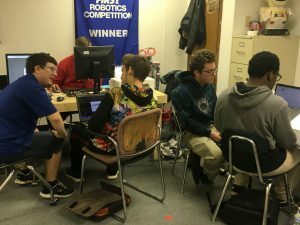 It has been shown that students who participate in robotics go on to be successful adults, not only in STEM fields but also in marketing, finance, and management. f(x) Robotics strives to mentor students in each of these areas. Your contribution to our organization will touch many lives for years to come and is truly an investment in your future. Thank you for your consideration and we look forward to hearing from you.